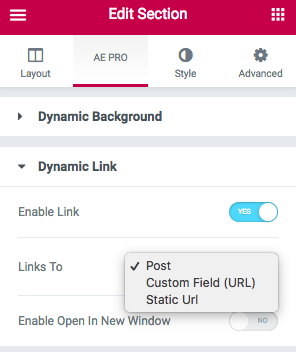 You can make Section/Column clickable by defining the link in the settings provided by our plugin. It allows 3 options to define target link. Post Link: It is useful when you are creating a Block Layout for Post Block widget. You can define the Link source to Post permalink. So when you click on this section, it will redirect you to that particular post. Custom Field Url: You can also a custom field that contains the URL. Clicking on Section/Column will take the user to that URL. Static Url: You can also specify a static URL.